In early 1747 the scientist William Watson spent a number of weeks using the bridge for one of his experiments to measure the speed of electricity. He stretched a wire from a Leyden jar across the bridge, with men at each end holding the wire and touching the water, so the current could travel across the bridge and back through the Thames. Later that year disaster struck. There had been rumours of cracks in some of the arches as early as 1744, but during the summer of 1747 there were signs of movement in one of the piers. Labelye was not particularly concerned at first, but in September one of the stones fell into the Thames. Attempts were made to help the pier reach a firmer foundation by adding 700 tons of cannon balls, but it was soon clear that this was not working. It was then decided to strengthen the pier by adding piles around it and to reduce the weight on it with an ingenious structure of internal arches with hollow spaces underneath them. During 1749 the two arches were dismantled and the piles driven in, using Valoue's machine, the work being completed in December. In February 1750 there were two severe earth tremors in Westminster, but fortunately they caused no further damage to the bridge. By November the arches had finally been rebuilt and the bridge was officially opened on 18 November. Starting at midnight, the ceremony lasted two hours, with processions over the bridge and the singing of 'God save the King' over the central arch. For the rest of the day the bridge and river were full of activity, with curious sightseers keen to see the new wonder. The bridge became so crowded that, ironically, many were forced to hire a boat to get home. 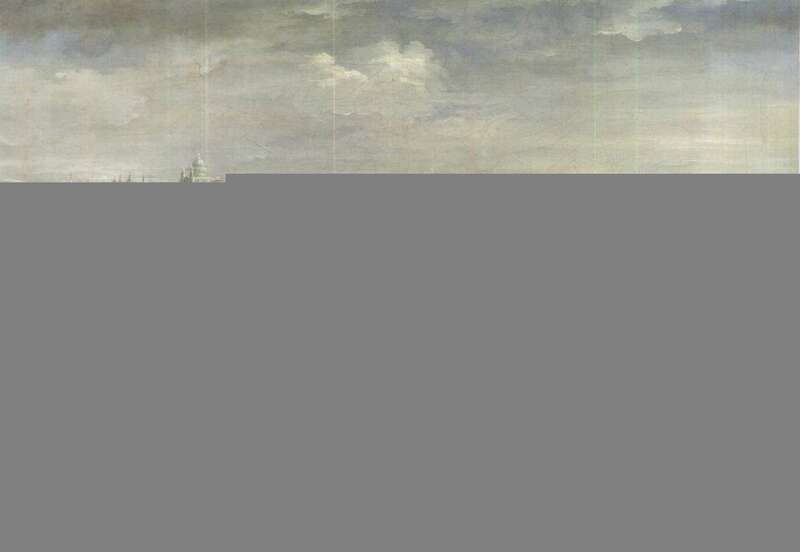 The Thames during the Great Frost of 1739, a painting by Jan Griffier the Younger. The two piers of Westminster Bridge at the extreme right were a popular attraction and ladders allowed people to climb up onto them. After all his exertions, and with the bridge finally open, Labelye now planned to write a book about the building of the bridge, but he was never to get round to it. In 1752 he spent some time in the south of France for health reasons and lived the rest of his life in obscurity, dying in 1782. The new bridge was not built in isolation but was part of a number of improvements in the Westminster area, as well as in the transport connections south of the river.The commissioners were granted powers to purchase all the property on the approaches to the bridge, and this allowed them to replace the narrow streets and squalid housing on the Westminster side with wide new streets, including Parliament Street, which was opened in 1756 and later extended to Charing Cross. The land on the Surrey side was mostly marshland and market gardens, and much of it belonged to the City and the Archbishop of Canterbury, who were able to negotiate a very good price for it.These purchases used up a large percentage of the funds available. The original estimate for a timber bridge had been £90,000, but the final cost of the stone bridge was around £390,000. As it was not a private development, no tolls were ever charged, but the Government continued to pay for its maintenance and security. Such was the popularity of the bridge that watchmen had to be employed, at first during the night, but later during the day as well, to stop people damaging the bridge or setting up stalls on it. The roadway needed regular repair and during the summer months it had to be watered to keep the dust down. The bridge was lit at night by thirty-two oil lamps, which were replaced in 1814 by gas lamps, and electric lighting was installed in 1898.